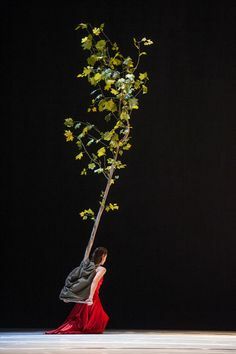 The last work of Pina Bausch, Como el musguito (“Like Moss on a Stone”) is said to have had a sense of the stage feeling haunted with her presence for more reasons than the piece premiering the same month as we lost this great force in the nature of expression. The second image is of Yukio Waguri (b. 1952). He was the principle male dancer at Tatsumi Hijikata’s Asbestos-Kan from 1972 to 1978. From this period, he kept notes of the words Hijikata spoke in order to stimulate dancers movement while choreographing. These words are called Butoh-fu, a unique method for choreography. Waguri has made his own interpretation of these words and continues to use them as a method for his own choreography and teaching. Butoh dance, was created by Tatsumi Hijikata and Kazuo Ohno, in response to the westernization of Japanese culture after WWII . During this era, rebellious artists entered into a process of finding new forms to address the changing world around them.